Last night was the first night I have really sleep since Tuesday. Wednesday morning around 4:00am we were awaken by the first line of storms, and lost power. Lucky for us our land phones worked on Wednesday, my family called to let us know as storm after storm approached us, it seems that first line had knocked out the tower for our weather radio signals. Also, I had my first hot shower this morning, it was wonderful! I have family who live in Sipsey, Cordova and Argo, all small communities near where Rick and I live, I spent Thursday trying to make sure they and many of my friends in Sipsey were ok. Thankfully, family members are good, one cousin lost everything. Many of my friends lost all they had ever worked for, but they still have their lives. In Sipsey, the nearest community to us, a couple were killed, their daughter spared because she was not at home. I still feel raw, and there are moments when the tears come like a flood, living here in the hills of Alabama I have always lived with the threat of tornadoes and in years past lost a family member in one. These were like none we have ever had before, until you see firsthand the devastation, words cannot describe it. But, now we have to figure out how to help......in these little communities .....most who live there are poor and middle class....many who lost all have no insurance, when I figure out what and how I will let you all know. Right now, it is all about food, shelter, and what to do next. this too shall pass, but I can also tell you, life around these parts won't ever be the same. The forty five seconds is how long the storm lasted in Sipsey. It was a half mile wide, and I am not sure how far it traveled, but in less than a minute lives changed forever. Limbo is a hard place to be......between the weather, the carpenter's schedule and ours.....construction is hanging in various stages on each of the three projects. I try not to look at the house, the barn, the yard, the garden, the flowers, the creative space anymore. When I notice my surroundings, I feel the anxiety and then I have to really practice what I teach.......BREATHE! I can take life in the fast lane, but limbo......I know this is all a lesson for me, and I am kicking and screaming as I am being taught. This too shall pass. But the uncertainty of it all seems to be filtering down into all areas of my life, I am floundering on everything. Grasping to complete simple projects and struggling with daily routines. Several years ago, we did a remodeling project and it was stressful, but not like this. We hit that project hard and heavy, worked til we dropped and then it was over. Everything seems out of balance and the harder I try to balance the worse it becomes. So tonight has become a night of reflection, some remorse, and a few moments of panic. But life is about balance, and when one part of your life is out of balance, sooner or later everything begins to shift.....that is what I feel tonight. This too shall pass. A hot cup of tea, a good night's sleep, the courage to let go......and faith to know, this too shall pass. Good night Sweet dreams. An empty page........it can be quite beautiful or quite daunting. There are nights when the words flow like milk and honey and my fingers can not move fast enough.....and then there are times when the words are hiding, refusing to come, no matter how much coaxing. It is not that I don't have thoughts tonight, but they are of the jet plane variety......they are flying through my brain so quickly I cannot slow them down. I have thought of friends far away today......and I miss them. Yes, there is e-mail, and phone calls and even Face Book, but it's just not the same........as a face to face, let's have a cup of coffee and spend the afternoon together kind of time. I want to share a meal, hug and sit for hours and laugh. With a couple of them, there would be some music involved also......so there might even be a new song or two written. I have friends in the yoga community that I get to see maybe once a year......I miss being in class with them, their encouraging words and amazing wisdom. Maybe that is why friendships are so special......time is limited and fleeting. You meet, you connect, and then life takes you down a different path. So, everything remains new and fresh, and when the fates do smile and you get to see each other again, you pick up where you left off. that is woven.......of old and new, giving richness and depth to life. The empty page tonight became a wistful lament on missing friends......I had no clue when I sat down where my fingers would travel. Now I am rather sad, as I have thought of friends that I would love to see. I promised I would share spring flowers with you all. I don't remember ever having rhododendrons and honeysuckle blossoms in the house at Easter, but it has been an extremely warm spring. My house smells of honeysuckle each time you walk through the door. I love them. The rhododendrons are beautiful, but they have no fragrance. Honeysuckles are lowly.....many around these parts think of them as weeds, vines that take over. But I love them.....the smell, the gentle fragile beauty of the flowers, even the vines themselves. Their coloration....soft creamy ivory, pale yellow and sometimes a surprising burst of rose and pink. No candle, no perfume that I have ever smelled, captures the fragrance of a real honeysuckle. It is sweet, but not cloy and there is an earthiness that gives the scent body and strength. The rhododendrons are just showy. 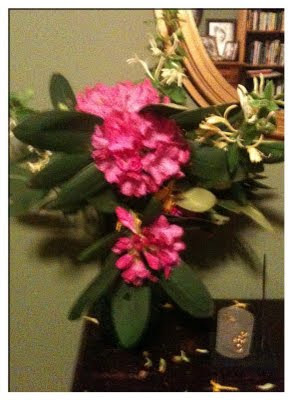 Ours covers almost one end of our house.....the leaves deep and glossy, the clusters of flowers saucer size and larger. When we planted it years ago, we didn't even know what it was.....just some sort of shrub. The first year it bloomed, we were like ok, we did good! The incense burner was a birthday gift from my friend Jackie. It just seemed the perfect match with the flowers today. And yes, when the petals fall, I leave them for awhile. The fallen petals remind me to enjoy the beauty while I can, this too shall pass. It has been a busy weekend, filled with friends and family......Monday comes so quickly. We have a gig coming up, so there will be lots of practice this week. The carpenters will be back, (I think they should just move in the guest room). It has been a warm beautiful day, one of the warmest Easters I can remember. I am hoping you all have a peace filled week, full of warm sun and beautiful flowers and much laughter. with the 50th celebration of the class of 1961 and tonight was a gathering of alumni all the way from 1947 to the present. My sister, Pat graduated with the 1961 class. I have attended more of her class functions than my own class. I love her class mates! I know that I was the bratty little kid who tormented her. she and her friends were like these magical beings who were always doing something special. Sometimes if I cried alot, my mom would insist that Pat take me to a ballgame with her or to a friend's house. Lucky for me, her best friend Asa, had a younger sister Johnnie so I got to go to Asa's house pretty often. The neighborhood we grew up in had a lot of kids. So, with two older brothers at home, and Pat, my younger brother Ricky and I had plenty of babysitters. All their friends dealt with us kindly......a couple of my older brother's friends taught me to shoot hoops when I was five or six. I had crushes on every boy that ever came knocking on our front door to take Pat on a date. My brother Ricky and I were only twenty-two months apart in age,, and since our brothers and sisters were older , our own friends thought we were the only two kids in our family. It was interesting growing up in a family with such a spread in ages. My parents were the age of some of my friends' grandparents. selling me to the lowest bidder! It was a good day, to be a part of something so special as someone's fiftieth reunion......I am glad my sister and her friends let me share their celebration. Some days you have to claim your space......those days when you feel the urge to crawl into the fetal position and pull the blankets over your head.....that is when you have to think large. All day Wednesday, every class I taught (private and at work) it seemed that every one wanted to be small. It's ok to to do that occasionally......lord knows, I have crawled into child's pose many a time and hoped for the best. But my intuition told me, I felt it deep in my heart that it was not the time to shrink, but to expand. I urged each student to think of claiming their space and their place here on earth, that each one had the right to be here and to thrive. I told them to think big, to take as much space as they possibly could as they did their asanas. We opened our hearts, lifted our chests, and spread our arms......we breathed deeply, stood strong with our feet grounded on our mats. Within ten minutes everyone had a different look in their eyes.....heads were held high, there were smiles and soon down right laughter. We have a right to be here. I think at some point in each of our lives, we have all felt small, all felt invisible or unworthy. There is a time to go inward, but sometimes when life has beat you up, when you have played the story a million times in your mind.......and you have beat yourself up.......then it is time to claim your space, your right to be here. So tonight, if you feel yourself getting smaller by the minute, stand up......reach up.....spread your arms.....plant your feet......take a deep breath and remind yourself you have a right to be here. We all have something to offer, something to bring to the table, we all are valuable and precious and we each have a purpose for being here. Maybe times have been hard, or life has just gotten too fast, it is easy to do, to feel small. Just remember, you have a right to be here. I leave you with a quote from one of my most favorite writings, I had a poster of this when I was in college. Out of the blue this morning as I was drinking coffee, I thought about my mother and cried. My mom had style and movie star looks.....she had olive skin, brown eyes and hair the color of deep rich coffee. My first memories of her beauty rituals...... brown Maybelline eye pencil, cake mascara, and red lipstick......and she sweetly wore the Evening in Paris perfume that my brother and I talked our dad into buying for her every Mother's Day. I remember her at family gatherings when I was a child, always slim, her legs crossed, and a cigarette between her fingers.....I knew that I would never be that beautiful. When my oldest sister married her husband told her, one of the reasons he asked her to be his wife was because our mom was so beautiful, he knew my sister would age well. Every Easter, my mom would go shopping....when I was small there were always frilly ruffled dresses with starched lacy crinolines, patent leather shoes and of course a hat. As I grew older, at last the ruffles were cast aside, but every Easter I got a new dress, and so did my mom. One of my all time favorites.....and the only time it ever happened......we had dresses alike, almost........hers was black, mine was white. I loved that dress! My mother loved suits and tailored clothing.....her favorite color was red. She wore high heels until she was eighty-five, I inherited my love of shoes from her. She never looked her age, and took great delight when people would exclaim about how young she looked. Something else I inherited......her nightly ritual......ALWAYS, take your makeup off, ALWAYS put your night cream on. Even when she knew she was dying, she wanted her nails done, her hair done. Some might say she was vain, and maybe on some level she was......but she also knew that in this world, as unfair as it is, people are judged by how they look......she would tell you looks were not everything, but it was important to make the most of what the good lord gave you. My mom struggled with me, I was blonde and blue eyed and fair skin.....so opposite of her. I entered a high school beauty pageant on a dare once, (no, I did not place) that night when we got home, she told me, as kindly as she could, don't ever do that again, it is not where you belong. Did I say that tact was not one of her strong points?ha ha! She taught me to sew my own clothes, she made many of hers and mine. In high school, I made almost everything I wore.......I have had the itch to sew again lately. I was good at it, my first major was fashion design. Easter brings a flood of memories for me about my mom, I didn't get her looks, but I think she taught me style. She was a stickler for posture, for manners and dare I mention again, she passed on her love of shoes to me! I have had the urge the past few weeks to go buy dresses, I think once again, it is the Easter holiday and memories of her that have triggered those urges. I see her now, in her favorite dress shop, looking, trying on and the look of delight when she found the one. Shopping with her was fun, and honestly, since she passed I have done very little shopping at the mall, it is just not the same. We sent her off in style, in a rosy red suit......I am sure she is somewhere tonight wondering why I don't have a new Easter dress. One year ago tonight, I wrote my very first blog entry.......I came to blogworld, kicking screaming and raising a ruckus! My husband, Rick pushed me head first into writing this blog........I finally caved because I couldn't stand to hear him badger me anymore. musings. Writing this blog has taught me so very much.....the most important thing being the power of words. I thought that I had always understood the power of the written word, but until I became responsible for writing my thoughts.....wow.....it is a heavy responsibility. the fact that we are all connected. It doesn't matter where we live, what we do, how we look.....we all want the basics, to be honored and respected, to have enough to eat, to have a roof over our heads, to be safe, to feel loved, to be happy......and I think those of us in blogworld, we cherish our creativity.......and the ability to share our thoughts. When I wrote my first blog, I didn't know if I would be writing a month from then. As I decided on my title, I knew I had to always be as honest as I knew how, that I had to write from my heart, and that I would be held accountable for my words. I have to share with you all, I still get so excited when I have a new follower(yes, I do my happy dance). I know that there are many of you who have hundreds of followers, but my faithful eighty-three are as important to me as eight hundred and three. You have watched me grow, you have lived through my days of incredible joy, and days of sadness, confusion and meltdowns. I am so indebted to you. Your comments have often made my days, the words of encouragement you give, the wisdom that you pass on, they are such valuable gifts and I never quite feel worthy of them, I thank you from the bottom of my heart. This blog has brought me a circle of friends unlike any I have ever had. Some of you are friends who know me, and this is a way for you to spend some time with me each day, most of you, we have never met........but when we do, it will be some more meet and greet! Thank you all.......good night, sweet dreams. I love the old Three Dog Night song, Joy to the World......the lyrics are simple and childlike.....but the definition of joy according to Random House....the emotion of great delight, somehow always makes me think of children. Jordan exhibits great joy at the simplest of pleasures, like eating strawberries or being tickled. He loves to be tickled, and you can hear his squeals of delight ring through the house when Rick tickles him. I have a graphic on my vision board that is quite joyful to me. It is two hands cupped together, with a woman bursting from the palms, with music notes and birds flying around her. It just speaks to me of the joy that I feel when I sing, somehow I think the artist captured it and didn't even know me. I see people every day that have no joy.......their eyes are sad and fearful, sometimes empty. But as the days go by, and I watch them as they come to class, in most I begin to see a spark of joy. Sometimes, it is a smile, or a twinkle in the eye, but life comes back and you see it in their faces. The first time you see joy in someone's face at the end of a yoga class is an amazing event. I teach a class pretty often that is based on gratitude and joy......my belief, without gratitude there is no joy, and we have to allow ourselves joy. I think it is so easy to be sad and fearful, after all that is all we hear and see on the media, we allow our joy to be stolen. But joy is simple, it can be a walk through the grass barefoot, an ice cream cone on a warm day, fresh strawberries, a hug, hearing an old friend's voice, watching a sunset or a sunrise, or the simple words .........joy to the world, all the boys and girls, joy to the fishes in the deep blue sea, joy to you and me! Doesn't that make you smile, I mean joy even to the fishes......that is some pretty serious joy to spread around! One of the best yoga teacher trainings that I ever attended was in Olive Branch Mississippi. The instructor had just gotten back from India and the training was magical, she had so much joy she truly glowed. One day after an eight hour session, as we came our of savasana(rest), she blasted us with "Joy to the World", even though we were exhausted, we all left smiling. redoing the barn, turning an old farmhouse into a creative/guest space and redoing the house. The house is close, maybe by next week, all work will move to the creative space and barn. I like order, when clutter surrounds me I go into "weird, freaky mode".......have been there for several weeks now. My flower beds are suffering, because there is scaffolding and planks and windows, surrounding the house......there are still windows to be replaced and the house gets a fresh coat of paint. Not only am I dealing with pollen, but also sheet rock dust(cough, cough). But I can finally begin to see light at the end of the tunnel of chaos that seems to have surrounded us for the past few weeks. chocolate for the trim and plum for the doors. Our front door has been purple for several years, it is just going a little deeper. space. Most of our living space is in shades of green and purple, I promise we have a very comfortable house. But now that we have made all the changes on the outside, I am getting the urge to do some things on the inside(look out Rick, get the checkbook handy). So once the cosmetics are applied, I will take photos and post them. One of the pictures that I have had on my vision board for the past two years, is an arbor at the front door steps.......finally I am getting my arbor next week, then we have to redo the walk and plant jasmine. My dream is every summer when you walk up to the front door, you will walk through an arbor of jasmine. My other dream is a round rock fire pit in the back yard, that may take a while. In The Rhythm of Life, Matthew Kelly talks about the the enemy of excellence is minimalism. It does seem in many ways we spend our lives doing the least we can do.....but imagine if you will, an NFL quarterback, he didn't get that position doing the least he could get by with, he did the most. I am as guilty as anyone of minimalism.....take for instance guitar practice, some days I look at the clock and think, what is the least amount of time I can practice......but the days when I am having fun, when I am thinking, wow I could do this all day......that is when my playing improves by leaps and bounds. But even when it is something not so pleasant, like a task at work or home that we don't really enjoy, we need to change our mindset. "What is the most I can do?" practice some more. "What is the most I can do?" "What is the most I can do? ", it all comes down to mindfulness, to being in the now.......concentrating on what you are doing now, the best you can do, the most you can do. five coats of primer (what is the most I can do?) she was amazed at how beautiful it looked. Right now, I am trying to teach this concept to Jordan, our three year old great nephew. Just like all of us, if it is something he enjoys, he's giving the most he can........and if it's picking up his toys, he tends to be a little minimalist. Sometimes I have a yoga student, who tends to expend as little energy as possible......that is when I usually compare yoga with life......."yoga is much like your life, you get what you put into it, if you don't put much in, then you wonder why you don't get much back" "What is the most I can do?"........ "what is the least I can do?" simple questions with life changing answers. The tapping of keys......that is the sound I make tonight. We just got home, I am freezing. A friend did an outdoor concert, it was a great venue......but it is in the forties with twenty mile per hour winds. Yesterday, we were slammed with tornadoes and around six inches of rain. My fingers are cold, my toes are cold.....I didn't know the concert was outdoors. I dressed cute, I did wear a leather jacket, but I should have wrapped myself like the Michelin Tire man! The good news, Rick and I were invited to play at this venue later(like when there are warm breezes). The venue is an art gallery and along with music fans, there were many arty types there tonight. I love to people watch, and when you are in the midst of creative folk......there is a lot to watch! The music was just as eclectic as the crowd, blues, rock, singer/songwriter, folk. There were men in smoking jackets, women in tuxedos and vintage cocktail dresses, tie dye tee shirts, sweats and bluejeans. It was like someone from a fashion magazine had a child with someone from The Rolling Stone.....really cool mix. My fingers are beginning to warm, I can feel them now......but alas, creative juices are still frozen. "Learning is finding out, what you already know. Doing is demonstrating that you know it. There is such truth in that statement.......we are all learners, doers and teachers. Every time I teach a yoga class, I learn something from someone in the class. Think about your daily routine, every day.....we learn, we do and we teach. We don't even realize the process. People ask us a question, we answer, we show someone how to do something, and we learn.......Maybe you show someone something that is so simple you do it without thinking, or you learn an interesting fact in the newspaper, you do something so well that it is second nature to you. Each time we have an interaction with another human, we learn something about human nature. We learn give and take, sharing, loving......we can also learn greed, and anger and hate if we allow ourselves. We learn if we are tired, we are probably not at our best. We do, something as simple as washing dishes without any thought to the process and we miss out on the now. We teach, others around us by responding to rudeness with kindness.....the list goes on and on. One of the ways that I am trying to learn, teach and do more is bringing as much joy as I can to my yoga classes. I have learned that when we laugh out loud in class at ourselves, we all try a little harder, I teach with joy and love and my students want to come back to the next class. I do every asana (pose) they do, so they can see that even when my pose is not picture perfect, it gives me joy. I am not sure if Richard Bach set out on his journey to write such beautiful wisdoms, but I find his writings wise and hopeful. I would love to sit down and share thoughts with him, to hear him speak of his inspirations and if there were demons along the way he conquered. For now, I try to remember........."we are all learners,doers, teachers." Jordan spent the day.......he informed me this morning that he needed fresh fruit......he asked for strawberries, pineapple and watermelon. He told me that kids need fresh fruit for snacks, so I told him that if he and Rick could hang together for a little while, I would go to the store. As soon as I came through the door with bags in hand, he was telling me.....hungry, hungry, hungry. I showed him the strawberries and he danced for joy. Before lunch he ate half a pint, after lunch he finished the pint. There was strawberry juice on his clothes, on his face, hands......everywhere! He had such a look of contentment as he ate those berries, and he did not gulp them down. He took small bites, he would lick the juice, he would look at the berry, he would smell the berry........it was quite an experience just to watch him. 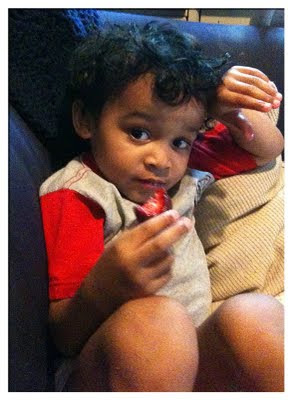 We should all savor our food the way he savored those strawberries! He did share a couple with me, but he was enjoying his berry experience so much, I just could not eat his berries. We spent most of the afternoon on the back deck building castles with wooden blocks. He showed me how to build a road and a railroad track. I love these days with him.......Seeing the world through a three year old's eyes is magical, he teaches me so much, I am sad when his mom picks him up. His biggest concern today......I had a bug bite on my face, he was so worried that it hurt......his medical advice.....a bandaid always makes a booboo feel better. For those of you who don't know.....Jordan is my three year old great nephew, his mom is a single parent in college and he stays with Rick and I when she is in class.....we love our Jordan days! Today has been an inward day for me....thoughts of so many of my friends who have had a difficult year, the obstacles they have overcome, the battles they have fought. This quote tonight is what I want to share with them, with all of you. It is easy to forget our strengths when times are tough. Tonight, many of you may be going through the same struggle that my friends are dealing with......illness and injury, hearing those words, just one more surgery or one more round of .....or there's an experimental program....you'll just have to live with it. Maybe you are in the midst of upheaval and tremendous change in your life.....early retirement, loss of job, relocating, retraining, loss of identity. It might be the loss of someone you love, a spouse, a parent, a friend, a child....how do you fill the emptiness? shed this morning at her house, and they were tears of joy and gratitude and celebration. We are stronger, braver and smarter! sometimes someone else has to believe it for us, but that's ok. I pray to God that we all have someone in our lives who can believe when we can't. I have always loved Pooh and his friends, the wisdom in his story is amazing. The kindness and friendships, well we should all take a lesson from Pooh. My Eeyore pjs are a wreck, I should have tossed them ages ago....but they make me smile, and they remind me of Pooh and all the gang....they remind me, stronger, braver, and smarter. Thanks for all the well wishes and good thoughts last night.....our county had a lot of damage, but thankfully this one skipped over us....and we kept our power! I have talked before about dreams, they are fascinating to me. Sunday night I had the most delicious ones.....all about being out west,the desert, the mountains, this incredible rock swimming pool. They were just happy dreams, you know the kind where you wake up and feel wonderful! and that smile stays on your face all day. Last night, well it must have been the energy from the storms, because the dreams got more and more curious as the night went on. My mom(who passed away five years ago)she was in this saga dream....now don't laugh, I was in a beauty pageant. I asked you not to laugh....someone cut my hair, my mom was screaming at me.....I didn't have my evening gown with me, (and Rick would not fetch it) and they pushed me out on stage in my street clothes. Now I ask you, where in the world did this stuff come from???? I woke up thinking that whatever I had for dinner, I would never eat it again! What can I say, sometimes my own dreams just crack me up! I think they deserve a closer look. I really do believe our unconscious tries it's best to help us out with what ever is going on in our lives.....sometimes our dreams are just a dumping ground, a filter if you will...a way for the brain to sort and help us deal with the good and the bad. For instance,take the dreams I had about being out west (the really good ones) I have been thinking about Arizona, really wishing that we could go back and spend some time. I think my brain was reminding me how much I loved it when we were there before. Then the wacko pageant dreams, a typical female... I have been rethinking my hairdo, maybe I should just leave well enough alone. At one time, I kept a dream journal. Just a simple notebook on the nightstand, and when I would awaken from my dreams, I would write down what I could remember. I'm thinking I should do that again. Wouldn't it be interesting to get a group of friends to keep a dream journal, then (instead of a book club) form a dream club and get together once a month and discuss your dream journals. Anybody out there interested????? I know that for some, dreams mirror the horrors that you have experienced. My kid brother had night terrors for years, I had nightmares. But dreams, no matter how real they seem, are like our past....no longer reality, but illusions that we keep replaying, until it all makes sense...or they become so ingrained that we embrace them as part of who we are. So, about those dream journals...you know, the dream club....any takers????? Once again, just like last Monday night, we are under the gun, weather wise. We keep getting warned of straight line winds that could exceed sixty miles per hour. This is an early post, because we may not have power later tonight. It has been warm and beautiful today, but way too warm for April. Mother Nature can truly pitch a tantrum here in Alabama in the spring. I love the energy of the storms, but I also know they can become quite deadly, so I cancelled my yoga class tonight. Didn't want any of my students on the road. Hopefully for our friends to the east, we'll take the brunt and things will settle down before this line reaches you. Rick will probably have dinner by candlelight tonight! The dogs are restless and nervous, so we are trying to calm and soothe them. Going inward, stillness.....in the past few weeks I have talked with people who froze when I mentioned those words. Even other yoga teachers seem to fear the very thing that the movements(asanas) are designed for. I have people constantly tell me that they struggle with stillness, looking inward. When I tell them that it is a practice, most then laugh and tell me they don't have time. I hear of more and more of yoga classes cutting short the savasana, the time of rest at the end of the class. We Americans work, or appear to work all the time....and when we aren't working, we are busy. It seems we are teaching our children to live that same life style. After school, there are sports practices, dance, gymnastics, games....when do kids play, when do they day dream about what they want to do and be, they don't have stillness or quiet time either. Many that I know work all the time, but they don't appear to be advancing that much in their careers, or pay scales. Rick, my husband retired a year ago, but his time seems to be taken almost as much as it was when he worked a full time job. All those time saving gadgets and appliances don't seem to be working. and realize that I have accomplished nothing, I have just been spinning my wheels. and I too, have to remind myself every day holds twenty-four hours and ten minutes is just for me....ten minutes for my soul to feel alive and peaceful, ten minutes for my body to refresh and relax,for my mind to clear,to take a deep breath......ten minutes, I know I am worth it. As a yoga teacher, I tell my students over and over....honor your body, listen to your body. As a yoga teacher, most days I think I practice what I preach....I eat healthy,exercise, spend lots of time outdoors, meditate, breathe.....but you know like every one else, life happens. Your plate over flows, the car breaks down, the stress sneaks in, and before you know it, you crash and burn if you're not careful. My body demanded I listen today. Actually it began last night, with almost unbearable fatigue....and I think maybe I have picked up a bug. But, I have rested, gotten lots of fresh air and had wonderful grilled crab claws, amber jack, oysters and scallops and shrimp tonight. I am about to have a cup of sage tea with honey and lemon....and I have thought a lot today about honoring your body. we have to take care of ourselves.....we have to honor our bodies. Tonight, with all the love in my heart and compassion in my soul.......honor your bodies. (I am always moving) or just the week catching up with me. I spent the day in a prenatal yoga training.....it was informative and interesting. being so immersed for the day in a subject that all your energy is directed toward the learning process and the subject at hand. Forgive me my friends, but I am in dire need of my bed.....hopefully a good night's sleep will restore my energy and words. There were a couple of folks in class who were not well, I hope they have not shared their "bugs" with me. We had a very cold snowy winter.....and very few times this winter was I ever cold. For the past two weeks, I can't for the life of me stay warm. It has been damp and a little cooler, but I am telling you all, my body is reacting as if it twenty five degrees. Maybe it is because the trees and flowers leaved and blossomed early this year....maybe it is because the days are longer and my body thinks more daylight means warmer temperatures, or as many of my friends will say "you're just crazy". I am so sorry I took the flannel sheets off the bed....they are going back on this weekend! We have two baby chicks....the momma hen has been as mixed up about the weather as I have been. She tried to hatch babies back in February. We finally had to take the eggs away, but she started all over and was successful this week. The chicks look like little fur balls of black and yellow. and enjoy what your body can do. I wish I could teach you all, I promise you would let go of some stress! Just for grins, (humor me) as you lie down tonight, breathe slowly, roll over on your right side, continue to take slow gentle breaths in and out of your nose, give yourself permission to rest. I will be getting up at the crack of dawn in the morning, going to a prenatal yoga teacher training. Will let you know how that goes down tomorrow night, I just hope it is warm! Good night, Sweet dreams! For the past couple of days I have visited old friends....The Doors. For some reason, I had not listened to their music in a very long time. That changed yesterday. The only music I have listen to for the past two days has been Jim and the Doors. I had forgotten how much I loved them. I had forgotten how intense, how sensual and clever their music is. The Beatles were smooth and polished, the Stones raw and energetic, but the Doors......that underlying sense of the blues, and then there were Jim's forays into the shadows of the mind, and of course his bad boy, sometimes nearly childlike sexuality. Listening to their music now is quite different......my listening pleasure has not been intensified by artificial means. Ha Ha! Hearing their voices, the way the songs were arranged and produced, quite intriguing. I remember playing their album and when my mom heard Light My Fire, she made me turn off the stereo. Their lyrics were so poetic compared to what I sometimes hear today. I was just a kid listening to those guys in the mid-sixties, but their music spoke to me. I was the good girl and Jim Morrison was the boy every mother warned her daughter about. I was a teenager when he died. As I have listened to his music these past two days I am reminded of how powerful music is. It evokes memories and feelings, it is a language that all can understand, music is a part of human fiber. Music can calm, stir, evoke, and kindle, it is a tool to be respected, and a part of creativity to be honored and cherished. As a blogger I understand the power of words, as a songwriter I understand the power of the song. We all have music that connects our lives.....to our past, to each other, to emotions and memories. For most of us, our taste in music changes as the years go by...but then there are those moments.....like yesterday, when I listened to Roadhouse Blues, so loud Ingrid's windows rattled, and it was only me, wailing the blues with JIm. Once again I am quoting from one of my all time favorite books, you can take this quote on so many levels.....for me tonight, I am thinking of my own personal growth. It is hard to change, to shift perceptions. Sometimes I am so overcome by my shortcomings that it would be easy to throw my hands up and quit.....and then I realize that lessons come hard and fast, seldom slow and easy. The past few months I have struggled artistically on many levels. Growing as a musician, a writer, a creator can be exhausting.....struggling as a human to become more humane and kind is just as exhausting and frustrating. Just when I think I might have reached some sort of achievement in any of it, at any level, I look up and the mountain is as tall as ever and I have only made baby steps. I am still in my cocoon. I think at times I have reached butterfly status.....and maybe that is just the way it is..... a circle.....cocoon, butterfly, time and time again as we go through life. but then those days when you feel your wings, when you feel as though you can soar,and you're as bright as a rainbow....that's worth being bound in the cocoon, that's worth the struggle. we'll fly once again. By the way, I have already seen a LOT of butterflies this spring. It has been a typical spring day in Alabama......warm, balmy, with a southern wind. It has been a typical spring night in Alabama.....torrential rain, hail, forty to sixty mile per hour winds, thunder and lightening. Driving home from class tonight, the roads were covered in leaves, limbs, and pine pollen, the temperature had dropped maybe ten or fifteen degrees, what a difference a couple of hours makes. The dogs were beside themselves when we walked in the front door. They are terribly frightened of thunder and lightening, Astro gets under Rick's desk, Bear gets under the kitchen table, Buddy climbs up on the couch and Taylor, well she is not afraid of anything. She lies in the middle of the living room, as if to say, "bring it on"! The rain, is falling on the tin roof, and is quite inviting. The storm line is past us now and it is getting cooler.....a great night for sleeping. My cup of hot tea awaits.....Good night, Sweet dreams. Blogging with a cell phone in the middle of a forest is rather challenging.....ha ha! So the first night, my phone died and you all were left hanging. (Rick and his friends were there to fly fish) We were at this plush cottage in the mountains near Helen, Ga.
but for some reason the "hot" spot wasn't hot. So, the second night I had withdrawals from blogging and last night I was still carsick and dizzy from the incredibly winding roads that I spent most of the day driving. I have never been carsick driving, interesting experience.......interesting trip. I had met Rick's boss, Dan about a year ago for all of five minutes. He set this trip up for Rick and another employee and himself, and invited me and his girlfriend. (Dan's girlfriend, not Rick's) Alison(Dan's girlfriend) was funny and charming so it made it much easier to spend two days with a stranger out in the middle of nowhere while the guys spent nine hours a day on the river fishing. I am intrigued to watch smart, educated men digress to bragging rights on how big the fish were,how many were caught and how cold the water was. It was catch and release fishing(I thought for sure I would get trout for supper one night) so the only proof that any of them had were photos on their cell phones. Honestly, it looked like the same fish in every photo. So, I had great German food on Friday,and a pedicure, then on Saturday, after making it to the flat highway, had incredible food at a place called Zepplins in Clayton, Ga. I bought a piece of stain glass for the new bathroom window, a purple butterfly. While Alison caught up on her sleep yesterday morning, I began to reread The Wisdom of Thich Nhat Hanh.......I had forgotten what a wonderful book it is. This time I am devouring it, word by word, highlighting passages and letting the wisdom of this wise and peaceful monk sink into my brain. In the beginning of the book there are a couple of places where he and a friend discuss "my time". The friend talks about how he use to look at time as divided, you know time for work, family, friends, and he never had any "my time". But he began to see that no matter where or how he spent time, it was all his time,so now he has unlimited time for himself. In yoga, we call it being in the now.....and honestly I am the worst at begrudging "my time", so now I am trying to look at all time as mine, no matter who with/ or how I spend it. It has been a long day, five hours on the road, unpacking, and now laundry. I think it is time to hug the dogs( I missed them so much), and call it a day. Good night, Sweet dreams. So glad to be back on line! And a nice straight four lane road.